The Commons is an elected body consisting of 650 members known as Members of Parliament (MPs). Members are elected to represent constituencies by first-past-the-post and hold their seats until Parliament is dissolved. The House of Commons of England evolved in the 13th and 14th centuries. It eventually became the House of Commons of Great Britain after the political union with Scotland in 1707, and assumed the title of "House of Commons of Great Britain and Ireland" after the political union with Ireland at the start of the 19th century. The "United Kingdom" referred to was the United Kingdom of Great Britain and Ireland from 1800, and became the United Kingdom of Great Britain and Northern Ireland after the independence of the Irish Free State in 1922. Accordingly, the House of Commons assumed its current title. 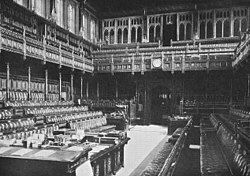 Under the Parliament Act 1911, the Lords' power to reject legislation was reduced to a delaying power. The Government is solely responsible to the House of Commons and the Prime Minister stays in office only as long as he or she retains the support of a majority of the Commons. The Commons may indicate its lack of support for the Government by rejecting a motion of confidence or by passing a motion of no confidence. Confidence and no confidence motions are phrased explicitly, for instance: "That this House has no confidence in Her Majesty's Government." Many other motions were until recent decades considered confidence issues, even though not explicitly phrased as such. In particular, important bills that were part of the Government's agenda. The annual Budget is considered to remain so. When a Government has lost the confidence of the House of Commons, the prime minister is obliged either to resign, making way for another MP who can command confidence, or to request the monarch to dissolve Parliament, thereby precipitating a general election. Parliament normally sits for a maximum term of five years. Subject to that limit, the prime minister could formerly choose the timing of the dissolution of parliament, with the permission of the Monarch. However, since the Fixed-Term Parliaments Act 2011, terms are now a fixed five years, and an early general election is brought about by a two-thirds majority in favour of a motion for a dissolution, or by a vote of no confidence that is not followed within fourteen days by a vote of confidence (which may be for confidence in the same government or a different one). By this second mechanism, the UK's government can change its political composition without an intervening general election. Only four of the eight last Prime Ministers have attained office as the immediate result of a general election; the others have gained office upon the resignation of a Prime Minister of their own party. The latter four were Jim Callaghan, John Major, Gordon Brown and the current Prime Minister Theresa May; these four inherited the office from Harold Wilson, Margaret Thatcher, Tony Blair and David Cameron respectively. In such circumstances there may not even have been an internal party leadership election, as the new leader may be chosen by acclaim, having no electoral rival (as in the case of both Brown and May). A prime minister will resign after party defeat at an election wherever unable to lead a coalition (including a supply and confidence arrangement). He or she may do after motions of no confidence/confidence and unprovoked such as for health reasons. In such a case, the premiership goes to whoever can command a majority in the House; unless there is a "Hung Parliament" (so coalition in the House of Commons) this will by convention be the new leader of the resignee's party. It has become the practice of writing the constitution of major UK political parties to provide a set way in which to appoint a new leader. Until 1965, the Conservative Party had no fixed mechanism for this; when in 1957 Anthony Eden resigned as PM without recommending a successor, it was unable to nominate one. It fell to the Queen to appoint Harold Macmillan as the new prime minister, after taking the consensus of cabinet ministers. By convention, ministers are members of the House of Commons or House of Lords. A handful have been appointed who were outside Parliament, but in most cases they then entered Parliament in a by-election or by receiving a peerage (being made a life peer). Exceptions include Peter Mandelson, appointed Secretary of State for Business, Enterprise and Regulatory Reform in October 2008 before his peerage. 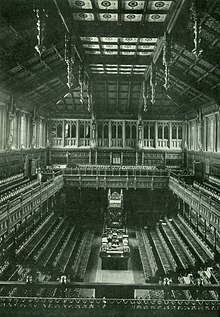 Since 1902, all prime ministers have been members of the Commons; the sole exception was during the long Summer Recess in 1963, the 14th Earl of Home, disclaimed his peerage (under a new mechanism which remains in force), three days after becoming prime minister, thereby becoming Sir Alec Douglas-Home. The new session of Parliament was delayed to await the outcome of his by-election which happened to be underway from a recent death. As anticipated, he won the pending by-election which was for the highest-majority seat in Scotland among his party, else would have been constitutionally obliged to resign. Since 1990, almost all ministers, save for three who are an intrinsic part of the House of Lords, have belonged to the Commons. Few major cabinet positions (except Lord Privy Seal, Lord Chancellor and Leader of the House of Lords) have been filled by a peer in recent times. Notable exceptions are Peter Carington, 6th Lord Carrington, who served as Foreign Secretary from 1979 to 1982, and David Young, Lord Young of Graffham, who was appointed Employment Secretary in 1985. The elected status of members of the Commons and being directly accountable to that House, as opposed to the unelected nature of members of the Lords, enables where coupled with empowerment and transparency, ministerial accountability. Responsible government is an international constitutional paradigm. The prime minister chooses the ministers, and may decide to remove them at any time; the formal appointment or dismissal, in formality, is made by the Sovereign. The House of Commons formally scrutinises HM Government through its Committees and Prime Minister's Questions, when members ask questions of the prime minister; the House gives other opportunities to question other cabinet ministers. Prime Minister's Questions occurs weekly, normally for half an hour each Wednesday. Questions must relate to the responding minister's official government activities, not to his or her activities as a party leader or as a private Member of Parliament. Customarily, members of the Government party/coalition and members of the Opposition alternate when asking questions. Members may also make inquiries in writing. In practice, the House of Commons' scrutiny of the Government can be fairly weak. Since the first-past-the-post electoral system is employed, the governing party often enjoys a large majority in the Commons, ministers and departments practice defensive government, outsourcing key work to third parties. In times of large majorities the constitution places no need or impetus to compromise with other parties apart from working in Select Committees for personal acclaim. Major modern British political parties tend to be so tightly orchestrated as to discourage room on most matters for free action by their MPs. A large minority of ruling party MPs are paid members of the Government. Since 1900 the Government has lost Confidence motions three times — twice in 1924, and once in 1979. However, the threat of rebellions by their own party's backbench MPs often forces Governments to make concessions (under the Coalition, over foundation hospitals and under Labour over top-up fees and compensation for failed company pension schemes). Occasionally Government bills are defeated by backbench rebellions (Terrorism Act 2006). However, the scrutiny provided by the Select Committees is more serious. 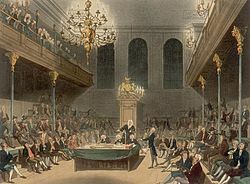 The House of Commons technically retains the power to impeach Ministers of the Crown (or any other subject, even if not a public officer) for their crimes. Impeachments are tried by the House of Lords, where a simple majority is necessary to convict. The power of impeachment, however, has fallen into disuse: the House of Commons exercises its checks on the Government through other means, such as No Confidence Motions; the last impeachment was that of Henry Dundas, 1st Viscount Melville in 1806. In 1918, women over 30 were given the right to vote, quickly followed by the passage of a law enabling women to be eligible for election as members of parliament at the younger age of 21. The only woman to be elected that year was an Irish Sinn Féin candidate, Constance Markievicz, who therefore became the first woman to be an MP. However, owing to Sinn Féin's policy of abstention from Westminster, she never took her seat. With effect from the General Election in 1950, various forms of plural voting (i.e. some individuals had the right to vote in more than one constituency in the same election), including University constituencies, were abolished. A candidate for a seat must submit nomination papers signed by ten registered voters from that area, and pay £500, which is refunded if the candidate wins at least five per cent of the vote. Such a deposit (see deposit (politics)) seeks to discourage frivolity and very long ballot papers which would cause vote splitting (and arguably voter confusion). Each constituency can be called a seat as it was in 1885, as it returns one member, using the first-past-the-post electoral system, under which the candidate with a "plurality of" votes wins, that is greatest number of votes. Minors (that is, anyone under the age of 18), members of the House of Lords, prisoners, and insane persons are not qualified to become members of the House of Commons. To vote, one must be a UK resident and a British citizen, or a citizen of a British overseas territory, of the Republic of Ireland, or of a member of the Commonwealth of Nations. British citizens living abroad are allowed to vote for 15 years after leaving. It is, as is intuitive, a criminal offence for a person to vote in the ballot of more than one seat which is vacant at any election. This has not always been the case as before 1948 plural voting was permitted as voters qualified by home ownership or residence and could vote under both entitlements simultaneously. A person may not sit in the Commons if he or she is the subject of a Bankruptcy Restrictions Order (applicable in England and Wales only), or if he or she is adjudged bankrupt (in Northern Ireland), or if his or her estate is sequestered (in Scotland). Previously, MPs detained under the Mental Health Act 1983 for six months or more would have their seat vacated if two specialists reported to the Speaker that the member was suffering from a mental disorder. However, this disqualification was removed by the Mental Health (Discrimination) Act 2013. There also exists a common law precedent from the 18th century that the deaf and dumb are ineligible to sit in the Lower House; this precedent, however, has not been tested in recent years. Anyone found guilty of high treason may not sit in Parliament until he or she has either completed the term of imprisonment or received a full pardon from the Crown. Moreover, anyone serving a prison sentence of one year or more is ineligible. Finally, the Representation of the People Act 1983 disqualifies for ten years those found guilty of certain election-related offences. Several other disqualifications are codified in the House of Commons Disqualification Act 1975: holders of high judicial offices, civil servants, members of the regular armed forces, members of foreign legislatures (excluding the Republic of Ireland and Commonwealth countries), and holders of several Crown offices. Ministers, even though they are paid officers of the Crown, are not disqualified. At the beginning of each new parliamentary term, the House of Commons elects one of its members as a presiding officer, known as the Speaker. If the incumbent Speaker seeks a new term, then the House may re-elect him or her merely by passing a motion; otherwise, a secret ballot is held. A Speaker-elect cannot take office until he or she has been approved by the Sovereign; the granting of the royal approbation, however, is a formality. The Speaker is assisted by three Deputy Speakers, the most senior of whom holds the title of Chairman of Ways and Means. The two other Deputy Speakers are known as the First and Second Deputy Chairman of Ways and Means. These titles derive from the Committee of Ways and Means, a body over which the chairman once used to preside; even though the Committee was abolished in 1967, the traditional titles of the Deputy Speakers are still retained. The Speaker and the Deputy Speakers are always members of the House of Commons. The Clerk of the House is both the House's chief adviser on matters of procedure and chief executive of the House of Commons. He or she is a permanent official, not a member of the House itself. The Clerk advises the Speaker on the rules and procedure of the House, signs orders and official communications, and signs and endorses bills. The Clerk also chairs the Board of Management, which consists of the heads of the six departments of the House. The Clerk's deputy is known as the Clerk Assistant. Another officer of the House is the Serjeant-at-Arms, whose duties include the maintenance of law, order, and security on the House's premises. The Serjeant-at-Arms carries the ceremonial mace, a symbol of the authority of the Crown and of the House of Commons, into the House each day in front of the Speaker, and the Mace is laid upon the Table of the House during sittings. The Librarian is head of the House of Commons Library, the House's research and information arm. Like the Lords, the Commons meets in the Palace of Westminster in London. The Commons chamber is small and modestly decorated in green, in contrast to the large, lavishly furnished red Lords chamber. There are benches on two sides of the chamber, divided by a centre aisle. This arrangement reflects the design of St Stephen's Chapel, which served as the home of the House of Commons until destroyed by fire in 1834. The Speaker's chair is at one end of the Chamber; in front of it, is the Table of the House, on which the Mace rests. The Clerks sit at one end of the Table, close to the Speaker so that they may advise him or her on procedure when necessary. 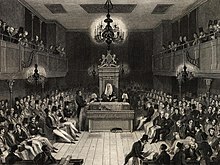 Members of the Government sit on the benches on the Speaker's right, whilst members of the Opposition occupy the benches on the Speaker's left. In front of each set of benches a red line is drawn, which members are traditionally not allowed to cross during debates. Government ministers and the leader of the Opposition and the Shadow Cabinet sit on the front rows, and are known as frontbenchers. Other members of parliament, in contrast, are known as backbenchers. Not all Members of Parliament can fit into the Chamber at the same time, as it only has space to seat approximately two thirds of the Members. According to Robert Rogers, former Clerk of the House of Commons and Chief Executive, a figure of 427 seats is an average or a finger-in-the-wind estimate. Members who arrive late must stand near the entrance of the House if they wish to listen to debates. Sittings in the Chamber are held each day from Monday to Thursday, and also on some Fridays. During times of national emergency, the House may also sit at weekends. When the debate concludes, or when the Closure is invoked, the motion in question is put to a vote. The House first votes by voice vote; the Speaker or Deputy Speaker puts the question, and Members respond either "Aye!" (in favour of the motion) or "No!" (against the motion). The presiding officer then announces the result of the voice vote, but if his or her assessment is challenged by any member or the voice vote is unclear, a recorded vote known as a division follows. The presiding officer, if he or she believes that the result of the voice vote is clear, may reject the challenge. When a division occurs, members enter one of two lobbies (the "Aye" lobby or the "No" lobby) on either side of the Chamber, where their names are recorded by clerks. A member who wishes to pointedly abstain from a vote may do so by entering both lobbies, casting one vote for and one against. At each lobby are two tellers (themselves members of the House) who count the votes of the members. For full details of changes during the 57th Parliament, see Defections, suspensions and removal of whip and By-elections. In addition to the parties listed in the table above, the Co-operative Party is represented in the House of Commons by 38 Labour MPs sitting with the Labour Co-operative designation. The "voting total" is the effective size of the House excluding vacancies, suspensions, the Speaker (originally Conservative) and three Deputy Speakers (two Labour and one Conservative) who have only a tie-breaking vote constrained by conventions, and seven abstentionist members (Sinn Féin). Eleven members are currently excluded under this definition, leaving party voting totals as follows: Con 316, Lab 254, SF 0, Speaker 0. The "majority threshold", the number of seats needed to have a majority of one, and "Gov short by", the margin by which the governing Conservatives are short of that majority, are based on the voting total. The "Gov + C&S majority" is calculated as the sum of voting Conservative and Democratic Unionist Party members, less the sum of all other voting members. ^ Members can be elected as independents or leave the party they were elected under. MPs suspended from their party are also listed as independent (see list). ^ "House of Lords Recess dates". Below is a brief account of the April 2, 1660 election in Notthingham, which sent two members to the commons. This is drawn from Lucy Hutchinson's biography of her husband Colonel John Hutchinson, and supplies a vivid picture of the electoral process. 'The Colonel' was a regicide, one of the 59 men who signed the death warrant of Charles I. This was a liability in 1660, but Hutchinson possessed immense support within Nottingham because of his leadership of the town's garrison during the civil war. Hutchinson and Arthur Stanhope stood for the two Nottingham seats, but Hutchinson was challenged by one Plumtre, a physician whom Lucy obviously disliked. Leading members of the town were summoned to an assembly on election day to give their approval to the candidates. Formal polling of the electors was not required, and often was unnecessary because electors tried to come to consensus even before the actual election. Note that Lucy considers it 'impudent' that Plumtre would call for a poll. "...Mr Arthur Stanhope...being pitched upon for the other burgess and having a great party in the town, was dealt with to desert the Colonel and offered all Plumtre's party. But, on the other side, he laboured more for the Colonel than for himself, and at length, when the election day came, Mr Stanhope and the Colonel were clearly chosen. Yet Plumtre's party were so impudent that they required a poll, and in the polling affronted the Colonel's friends and played very foul; whereat the Colonel was not at all moved, but with a very unconcerned pleasantness made himself sport at their malice, which made it turn to plain fury and madness. Hill stood to take the poll, and when the Colonel came to give his vote for Mr Stanhope, he was to cast away the other vote; and being asked who he would nominate he made them set down Mr Joshua Hill. 'For,' said he, 'if the Doctor carry it from me, I will give him his apothecary to attend him'; at which Hill foamed, and after they had ended their vain labour went home in a rage and beat his men and his maid." how many sat in the House ? now the dailies are available from aprill 1660: here you can pick year and month then the day of interest or use search for an item of choice. source for thought on pretty words by King and Speaker.